Camp Offered March 11–15. Registration is March 5–7. CORPUS CHRISTI, TX – Keep your children engaged in fun activities while on their much-anticipated spring school break. 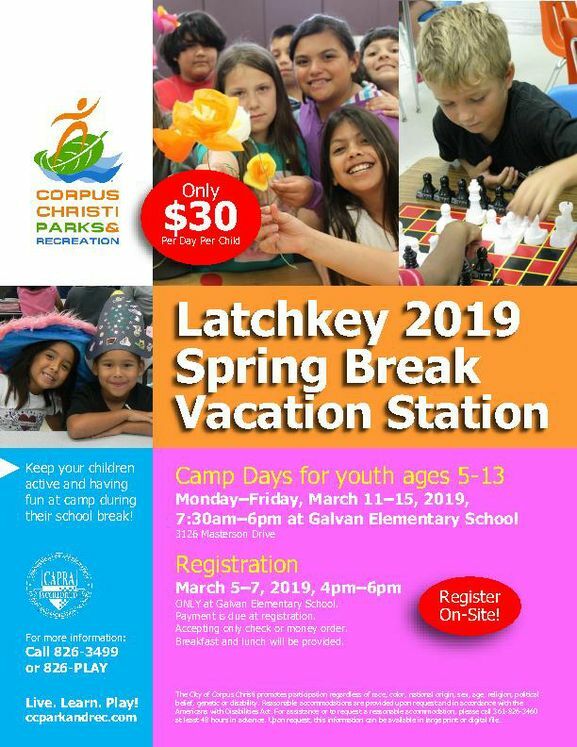 The Corpus Christi Parks & Recreation Department will be offering its Spring Break Vacation Station for boys and girls ages 5 to 13. The structured recreation camp will be held Monday through Friday, March 11–15, from 7:30am to 6pm at Galvan Elementary school, 3126 Masterson Drive (map). Our trained and enthusiastic staff keep children involved in a variety of activities, from playing sports, participating in gaming tournaments, creating arts and crafts, to listening and learning from guest speakers and so much more! The Vacation Station camps provide the supervision for children working parents seek. They are offered in collaboration with the Corpus Christi Independent School District during school breaks. Breakfast and lunch will be provided. Parents should send a snack for the afternoon with their child (no glass containers, please). Cost is only $30 per child per day. Don’t wait, REGISTER your children March 5–7 from 4pm to 6pm at Galvan Elementary. For more information and space availability, call (361) 826-3499 or visit www.ccparkandrec.com (click ‘Latchkey Program’). Reasonable accommodations are provided upon request and in accordance with the Americans with Disabilities Act. For assistance or to request a reasonable accommodation, please call (361) 826-3499 at least 48 hours in advance.